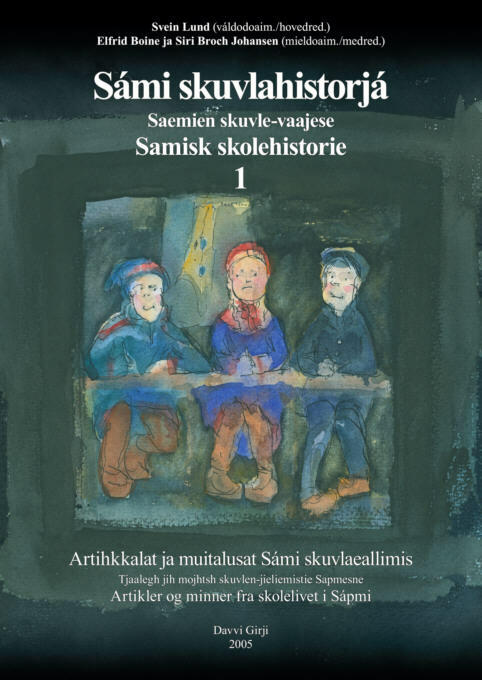 From many sources it is asserted that in the time of the norwegianization it was strictly forbidden both for teachers and pupils to speak Sami in the schools, even in the breaks, and that pupils were punished if they spoke Sami with each other. 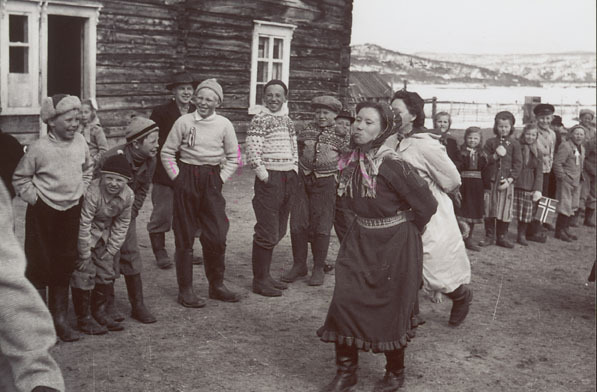 Others have asserted that there never existed any prohibition, but that the teachers were allowed to use Sami as auxiliary language to the extent it was necessary and that the pupils were free to speak their own language with each other. Who is right? Or does a clear answer exist at all? 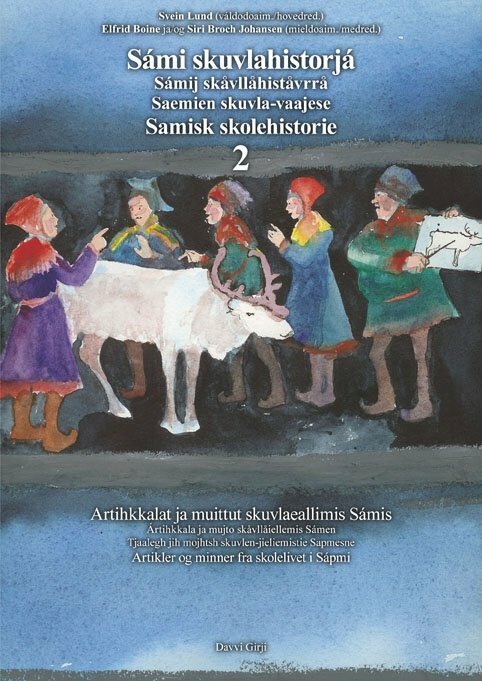 In the series of books Sami school history there are many stories which can give a pointer. Extracts from five of them have been recounted in the article On Sami teachers, which was printed in Ávvir 23.05.2009 (http://skuvla.info/minaigi11-n.htm). We will supplement them here with some more stories to see if it all together makes a picture of the relation between the regulations and the practices for the use of language in the school. At first we will have a look at the regulations and practices for the teachers. What did the regulations state? 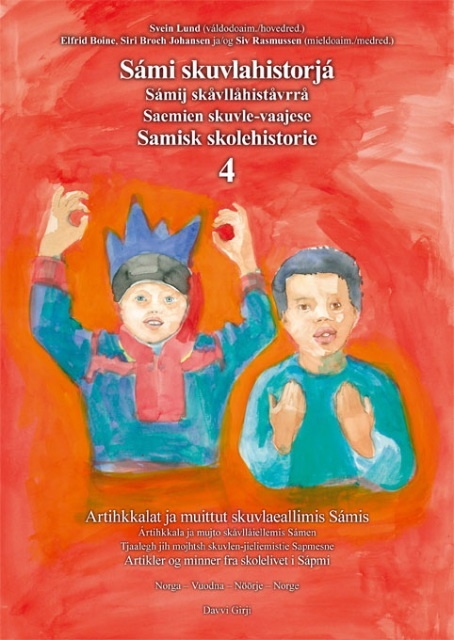 The use of language in school has been regulated by school laws and language instruction for the Sami and Kven areas. 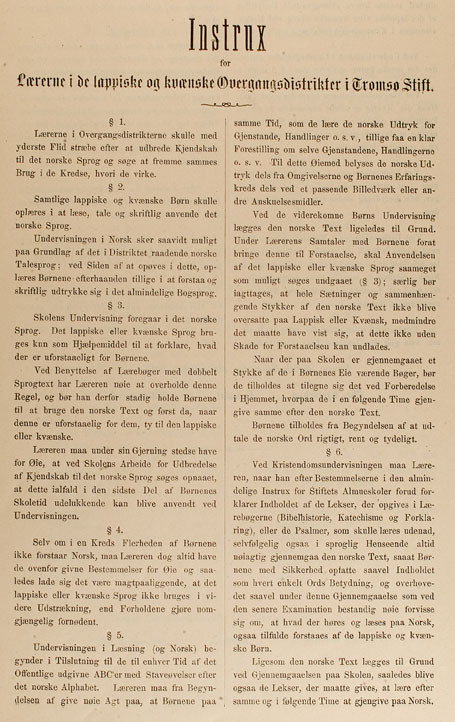 The school laws from 1889 and onwards established "the teaching in the school take place in Norwegian language". The language instruction came in four editions: 1862, 1870, 1880 and 1898. The changes in the instruction took place on two levels: The use of Sami and Kven language was steadily reduced, while the geographical area where the instruction was applied was extended. According to the first instruction, the pupils should learn to read, talk and write Norwegian, but at the same time they should learn to read Sami. Later the aim to learn Sami was removed, and Sami was reduced to an auxillary language which was only to be used if it was "inevitably required". How to interpret this then became a matter as to which opinions differed. 1880 instruksa skuvlla giellageavaheami birra mielddisbuvttii ahte dáruiduhttin šattai vel gárraset go ovdal. Unna rievdadusaiguin 1898:s dát lei skuvlla politihka sullii 1960 rádjái. What the pupils experienced was not always in accordance with the valid instruction. A great part of the teachers teaching Sami speaking pupils did not know enough Sami to be able to use it as auxillary language. 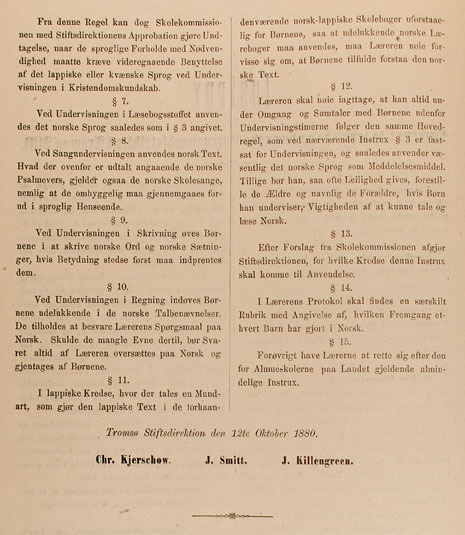 At the same time many teachers could have used the auxillary language, but they did not do so, as they either themselves were of the opinion that it was better to use solely Norwegian or they had interpreted the orders from their superiors in such a way that they should not make use of anything but Norwegian. On the other had there were teachers who used the "auxillary language" more than what the instruction opened for, because they meant it was pedagogically necessary. This applied both to Sami teachers, and some Norwegian teachers who had learned Sami. Probably there were also a few Sami teachers who spoke too poor Norwegian to be able to follow the instruction entirely. Our teacher spoke Sami and Finnish. He had been taught at school in Lakselv. When he attended school they had bilingual textbooks. but had to teach us to read in Norwegian. "Fire" (4) and "fem" (5) the teacher said. It was difficult to understand the meaning. The teacher said it meant “njeallje” and “vihtta”. – It was a Sami speaking teacher there, Kirsten Porsanger Sara. She normally spoke Norwegian in the lessons. She made a quite clear separation: in the lessons she mainly spoke Norwegian, while she spoke Sami with us in the breaks. If we did not understand what she said in Norwegian, she would explain in Sami. – In the school there was only one teacher who knew Sami, Anders O. Eira, who came from Máze himself. He taught us in religion, which was the only subject in which it was allowed to teach in Sami. We also had Bibel-history books in Sami. I think Anders spoke more Sami in the school than what he was supposed to do according to the rules in force at the time. 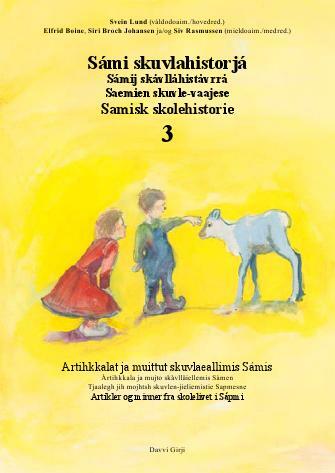 – In the fifth grade they had a Sami speaking teacher again, his name was Kristian Nymo and he came from the village. Father tells that this teacher taught in Sami, although it was not allowed at all. Probably the teacher understood that the children were not able to learn much in the foreign language. He taught and explained everything in Sami. Similar stories are told by Jon Ole Andersen from Polmak school (SSH1) and Karl M. Paulsen from Musken in Tysfjord (SSH2), both recounted in the article mentioned above. – On the conterary teacher Soleng and teacher Nordnes, probably both spoke Sami, but they only spoke Norwegian in school. – I remember three teachers: Alfred Larsen, Anders Bongo and Edel Hætta Eriksen. Sami was the mother tongue for all of them, but it was strictly prohibited to speak Sami. Therefore they all taught in Norwegian. Bongo spoke Sami only when he got angry. When we did not understand, they hit us with the pointer in the head, and of course it happened often that we did not understand. Inger Marie Sokki Hætta muitala su oahpaheddjiid birra: "Buohkain lei sámegiella eatnigiellan, muhto lei áibbas gielddus sámegiela hupmat. Danin buohkat oahpahedje dárogillii." – The teacher was Jan K. Lund. He had supposedly learned Sami, but he had made it his principal to only use Norwegian at school. – The teacher was Norwegian speaking, Madsen. I did not understand anything. He was supposed to speak Sami, but he was not allowed to speak Sami in the school. That's how the politic was back then, Sami language was supposed to be eradicated. There I learnt almost nothing as everything was in Norwegian. 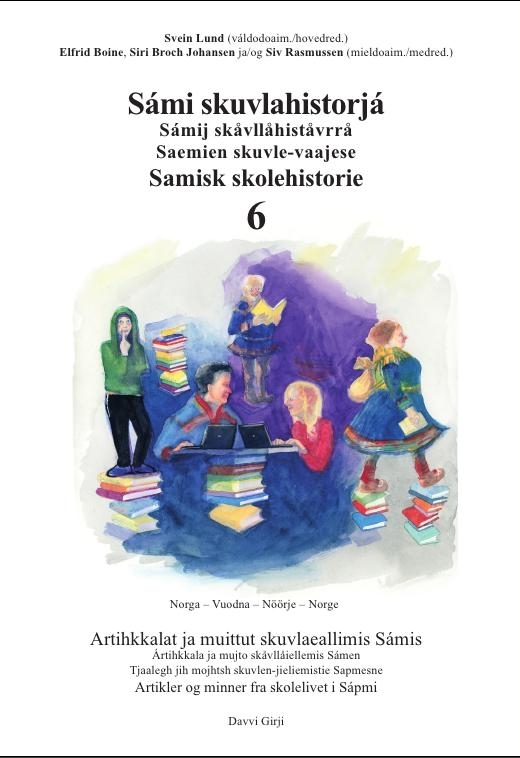 Well, some of the teachers spoke Sámi but what good was that when teaching in Sámi was prohibited. 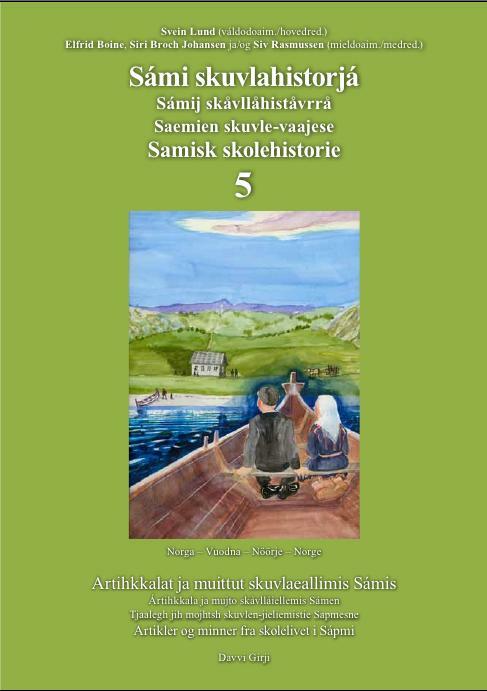 – A few teachers were Sami speaking, but they did not use Sami in the school. Therefore it was not a great difference between the Sami speaking and the Norwegian speaking teachers. – As everybody probably will understand, I did not know a single word of Lappish (Sami) when I came to Karlebotn. I tried to learn a little bit, because I am very interested in languages. ... But nevertheless it went pathetically slow for me, and as of today I still do not speak any Lappish. The reason the results were so poor, is that I was not supposed to say anything in Lappish in the school. I was supposed to speak Norwegian, speak slow and clear and try to make myself understood by that. Therefore it was not necessary, and I believe not wanted either, that I learned anything of the children's language. – We were one teacher short just before the school started. 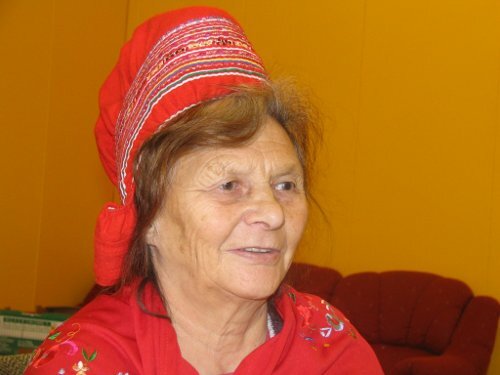 The school council made the superintendent of schools aware that there was a young person in the village who spoke Sami and who would like to be a teacher in the school. He was a student with a couple of years experience as a teacher. But the superintendent of schools turned down the proposition. And a young female student from Oslo arrived a few days later. She had just finished her upper secondary school exam in the spring, and didn't speak any Sami of course. This shows how the school politics in the Sami area was in those days. All teaching should be held in Norwegian. It varied how strict the practice that the teachers had to teach in Norwegian was applied. In the next article we will have a look at how the norwegianizing steered the pupils' use of language.